This art piece was doomed to be unfinished, untouched for months but still in the range of daily examination. The aha! direction found me as I drove over the mountains, pondering my child’s life. “He’s never going to be happy until he learns to dance on the rim of nothingness.” I thought. “No, it is I that needs to learn that dance.” I argued back. I returned to the studio and cut a hole in this work. I worked quickly, finding materials oddly at hand. I hummed the hymn, “I’ll praise my maker while I’ve breath.” I thought about little Mary at the annunciation, her receptiveness to impossible news. The dance on the rim of nothingness (or everything) is old. In Advent we wait. We prepare. And some of us dance. Join me. 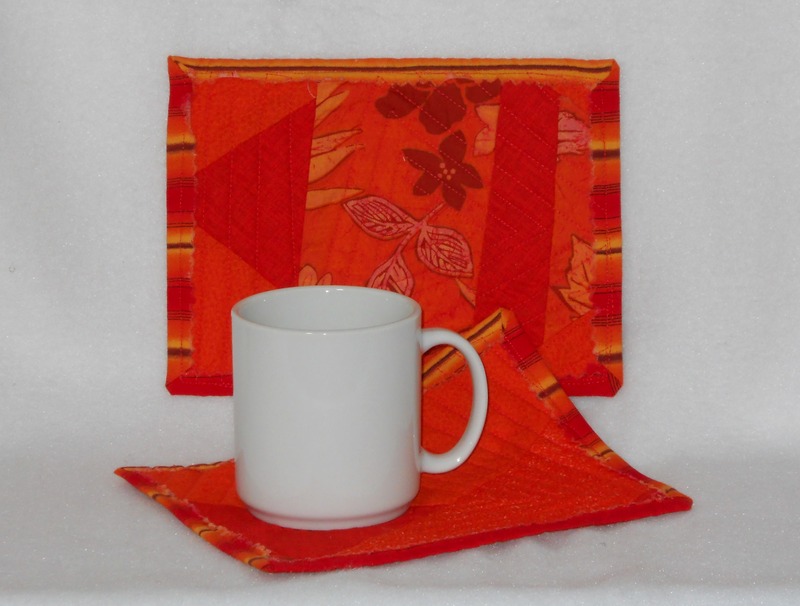 Beginning today, fibergig will donate 10% of the sales of our food-related products (aprons, mug mats, table runners, napkins) to local and world hunger efforts. Our heritage includes daily stewardship practiced on a family farm in Illinois. I used funds from my part of this farm to create the craft business I share with my daughter Emily. 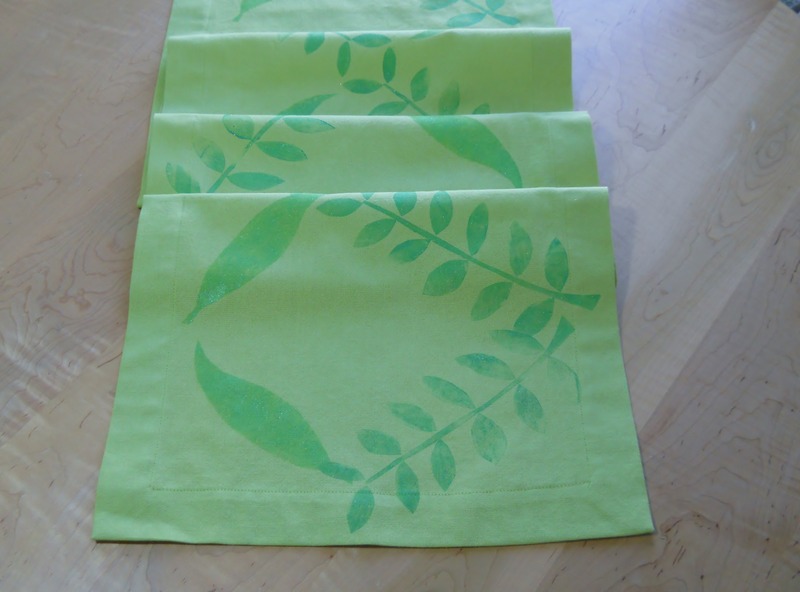 We are moving farm money through textile art and crafts to bring food to tables. We will contribute non-local funds to ELCA World Hunger. My parents, Wesley and Juanita Terpening, valued good food and the sharing of it. Wes actively farmed, even on crutches, until his body said no more. Juanita worked in a nutrition program and with the community food pantry to improve meals for many people. Every holiday meal began with her request, “Come to the table.” Every family meal began with a table blessing. Their grandchildren are now a generation of foodies. Loss of employment during the economic downturn reduced our generosity. We want to recover the act of sharing good food. You can help. 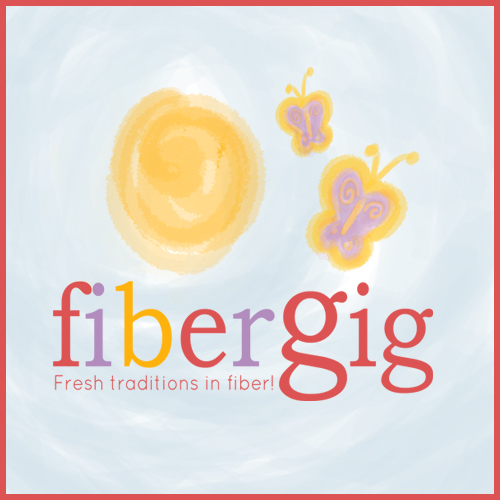 Products are available at our Fibergig shop. 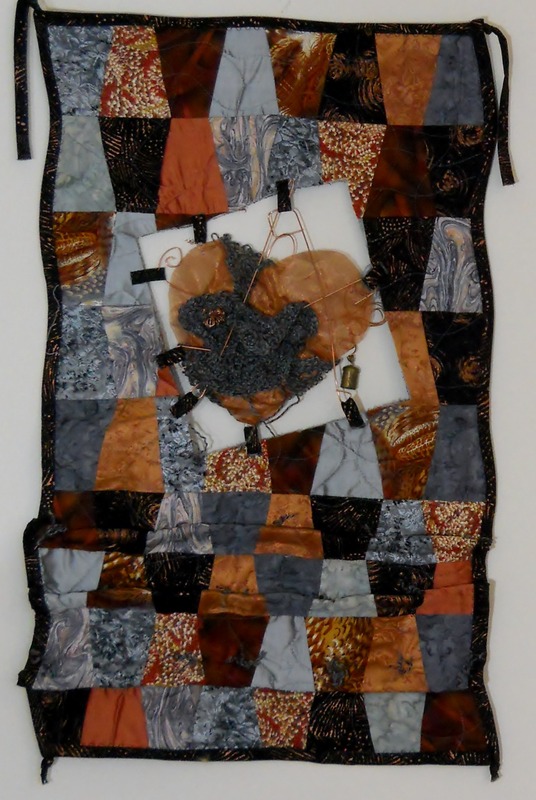 Art quilt, Heart’s Desire, illustrates the courage to cut a hole in a quilt, to let go of one pattern to become something new. Personal collection of Norma Colman. 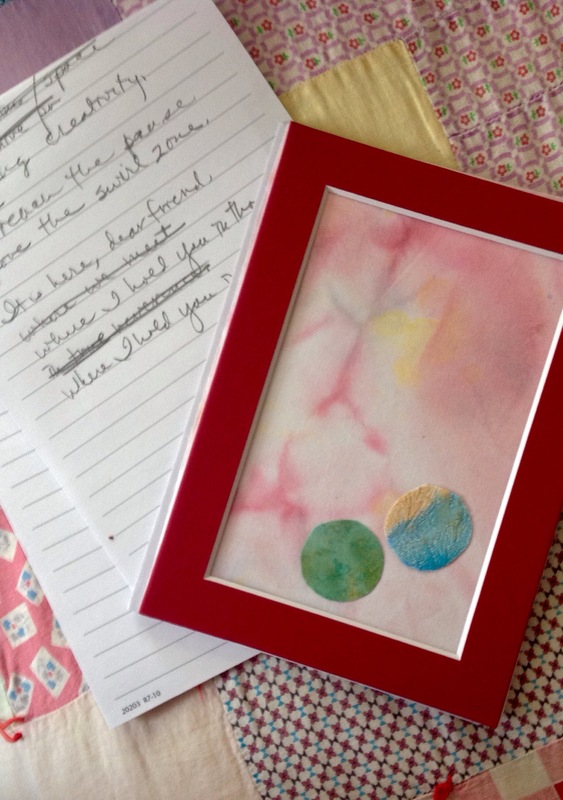 There has been discussion recently about what pieces of artwork I would not sell. This is one of the few. It evolved over several years. 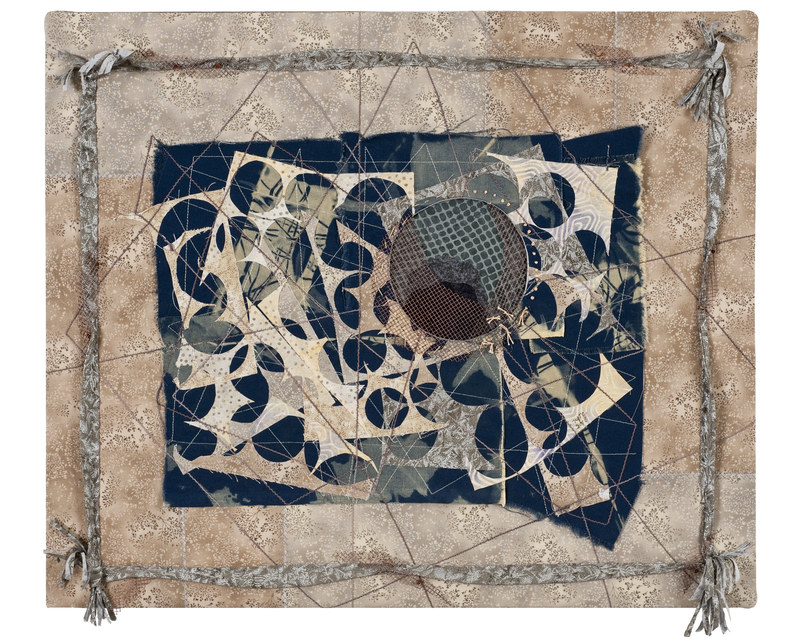 It began as an 18″ square, my response to a class assignment to work in a monochromatic color scheme. 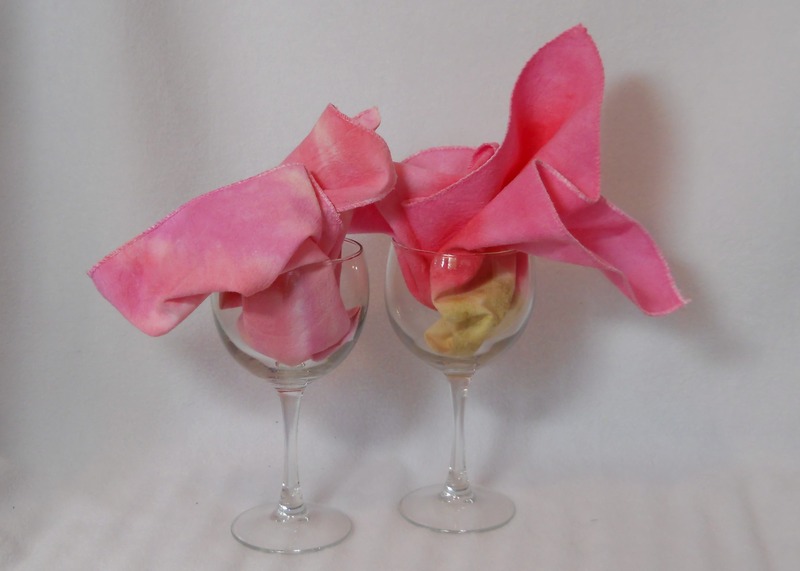 I loved the unfinished results for several years; I remained unwilling to take a next step. Then came the day when it was in hand and I was in courage zone. I put it on the cutting mat and divided it into 16 even pieces. Eventually the pieces were arranged with smaller squares of window screening on a background of embroidered and tucked cotton batiste, then corralled in a red metal frame. 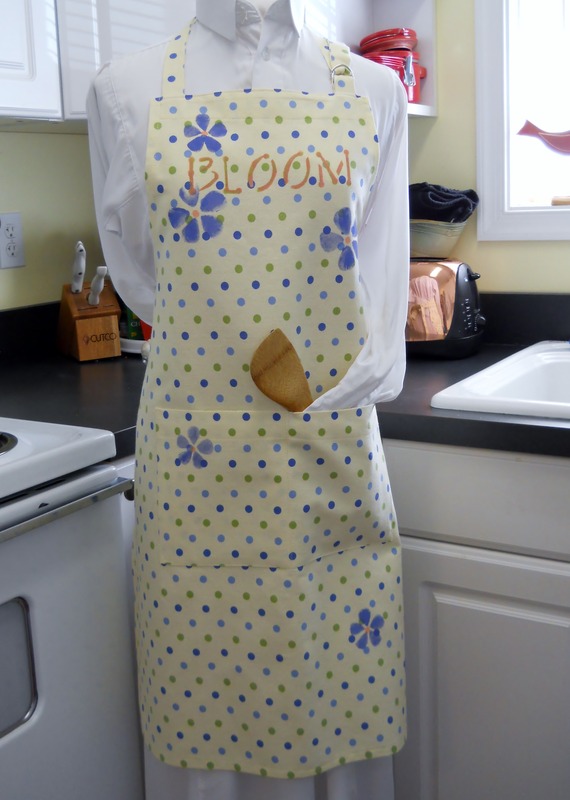 Today this piece hangs in my kitchen, right over the counter where I pour my morning coffee, chop vegetables, and paint fabric. When I see it, Psalm 51 floods through me. Create in me a clean heart, oh God, and renew a right spirit within me. Cast me not away from your presence and take not your Holy Spirit from me. Restore unto me the joy of your salvation and uphold me with your free spirit. I call these verses my artist’s prayer. It was my favorite section of the liturgy I sang as a young person. It always seems a good place to come to before beginning a creative endeavor. Well practiced artists can move along for hours, days, months without giving the need for courage a thought. Well, at least I can. And I haven’t heard this topic come up often, so I think I am ok in this perspective. Mostly, it is our own courage that is an issue. 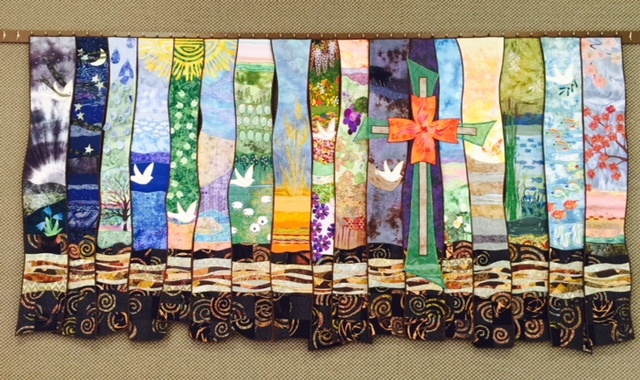 A friend of mine recently showed a successful art quilt at our local quilt group. 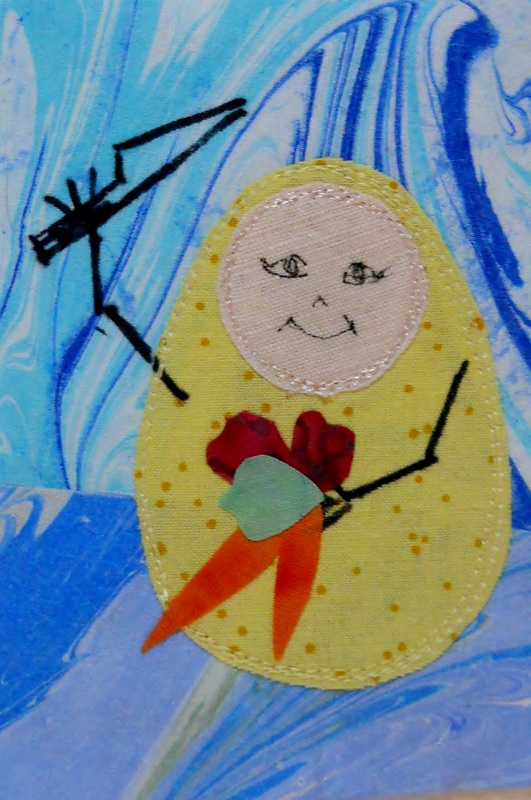 She and I are the experienced art quilters in this traditional guild. The others were appreciative of the finished piece. 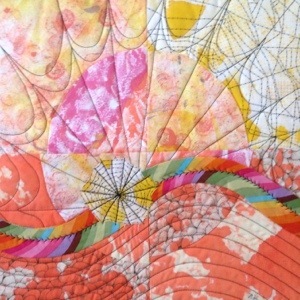 But as she shared about her process, she talked about not being happy with it after the binding was attached. So she decided to overdye the whole piece. I was immediately taken with the courage of that action, but it was regarded as a matter of course to the others. And so she did not elaborate. I was still digesting the courage to take a good quilt and subject it to a dye bath in the hopes that there will be a better quilt in the end. So no questions from me. Several weeks ago I faced a moment of courage. I was working on a piece inspired by a local mill wheel. There was a due date on this project, so extended contemplation was not on the schedule. I had pieced and painted a pleasing background. Then I stitched the wheel shape on top. And it all went static. I was heart sick. I left the piece on the work table. The next day I hung it on the design wall. I looked at it. I avoided it. I decided to start an entirely different piece. Two days later, the aha moment struck: cut it up and rearrange it. This has worked for me in the past. It has also failed. I am better at engaging this step when I have more distance from the piecing and painting efforts. But the due date demanded a decision. I hesitated with rotary cutter in hand. I sighed. And I cut 4″ strips from the center out. As I moved the strips around, I found a pleasing arrangement that suggested energy and movement. I began to think about where and how I would add the wheat. I was back in the zone. Neither artist was plunging into deep unknown territory. Each possessed skill and experience. But each risked the loss of valued work. Courage was summoned. Better art evolved.